The top priority in a race to save the gammon is to get all fifteen men into the home board as soon as possible. It is usually best to play each roll entirely within the outerboards, either moving men closer to home or moving them to the 6-point. It is seldom correct to use part of a roll to move within the home board. Needless to say, there are exceptions to this general principle. Some exceptions occur on the next-to-last roll of the game when only one man remains outside the home board. The player will lose a gammon unless he bears off a man next turn, so both numbers of his next roll have a crucial duty to perform. One number will bear the last man in, the other will bear a man off. With every home board point occupied, the next-to-last roll is easy to play. You maximize saving rolls next turn by moving the outside man as close as possible. But playing the next-to-last roll becomes more complicated with "gaps" (empty points) in the home board. 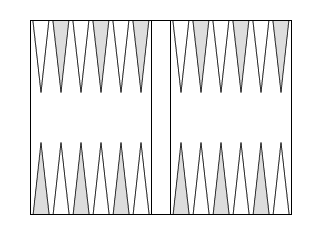 Gaps can nullify the value of certain last-turn rolls, especially if the number of an empty point is the same as one of the numbers rolled. The number can be too small to bear the last man in and incapable of bearing a man off because of the gap. In certain cases, the next-to-last roll is best played by using part of it to fill a gap within the home board. Usually a 1 is the number played inside since it is the least effective number for moving the outside man closer. A helpful guide in identifying these situations is what the author calls the "Rule of Sevens." The rule states that for purposes of saving the gammon, it is undesirable to have the last outside man seven points away from a gap in the home board. The reason this spacing is unfavorable is that it makes a particular number unusually inefficientit barely fails to reach the 6-point and it fails to bear off a man. In the diagrammed position, Black can use the Rule of Sevens in deciding how to move. With each given roll Black uses the higher number to move his outside man closer. With a 3-1, Black simply moves to the 11-point. It's important to move this man as close as possible, and according to the rule, there is nothing wrong with being eight or ten points from a gap. With a 5-1, Black should again take the full roll outside with 15/10/9. He avoids a spacing of seven in the most effective way possible: he moves out of it by continuing to advance his outside man. Black again faces a spacing of seven if he plays the entire 6-1 outside. Advancing that last point does little good since all 1's except 1-1 lose a gammon next turn. A much better play is 15/9, 2/1, filling the gap on the 1-point with the 1. Now only 2-1 will lose a gammon. From: Winning is More Fun, which will soon be available in bookstores.